It looks like this week will be dedicated to the government scene in the Illinois capital city of Springfield. Tomorrow, we'll be bringing you the best fashions around the Capitol, but today we have to spotlight 3 favorite places to eat: Cafe Moxo and Nick and Nino's Steakhouse. 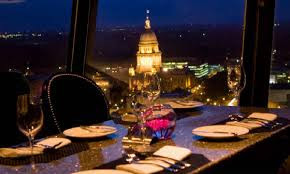 These places cover all the meals you need when visiting Springfield to either lobby or see the historical sites. I love this place. Their breakfast and lunch menus are unmatched and the staff is full of great people. They treat you like family and the customer service is award-winning. My favorites start with their oatmeal and made-to-order breakfast sandwiches, but the strata and french toast are tasty as well. They have fresh parfait, too. You can't go wrong. Often, days at the Capitol can get quite busy. 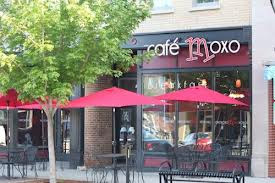 You can always count on Cafe Moxo to save your stomach in the clutch. They have bag lunches including a sandwich, chips or pasta salad, drink, and a cookie. You can't beat this--especially between committee and floor debate. Moxo delivers, which is incredible helpful. If you're a tourist, take the time to sit-in and enjoy the atmosphere. They have outdoor seating for nice days, with comfy couches and a fireplace inside to keep warm. I can't say enough great things about this place. Check them out on their site, on Yelp and Trip Advisor, and follow them on Twitter! End your long days here. Open Tuesday - Saturday, this spot in the Springfield Hilton is a must. You are seated at the top of the capital city, and served by the a wonderful staff from the moment you reach the hostest. The food here is great. Seabass is perfect. Steaks are perfectly cooked, and the flight of filets will make your tastebuds extremely happy. The drinks at Nick and Nino's are just right to unwind. In conjunction with their Pinnacle Club bar, the mixed drinks, wines, and spirits are worth every sip. The atmosphere is great. It's laid back and relaxing, yet just right for sharing laughs with coworkers or friends. 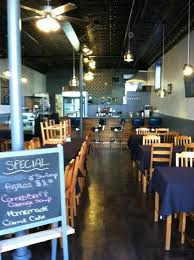 Check out Nick and Nino's for dinner when you visit Springfield. You won't regret it. Book on Open Table now. This little gem is new to the city, but no less fabulous. The decor has character and the staff is extremely personable--even up to the chef herself, who comes out to chat with patrons. The Fish Vera Cruz is a favorite, preceded by brussels and bacon as an appetizer. There's a full bar, you must try the Whiskey Pie. Everything is made fresh everyday. La Calia has a great vibe for casually relaxing with friends after work, listening to the music in the background and talking about the art lining the walls. It's also right across the street from the Abraham Lincoln Presidential Library and Museum, so stopping there before or after is a must, too. Yes, there are other places to eat in Springfield. But these 3, you just can't miss.